Whether training, on patrol or in the field, our police officers, firefighters and other first responders and our military men and women operate in some of the harshest of environments where computing is critical for communication and situational analysis. This is why choosing the right device to support these situations is often paramount to their success. Non-rugged notebooks show a failure rate 4.5 times higher than rugged notebooks. 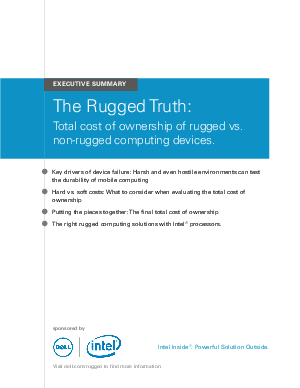 For a five-year period, the total cost of ownership of non-rugged computing devices is more than twice the cost of equivalent rugged equipment. Post-deployment cost, including downtime and support, consumes in excess of 80 percent of the total cost of ownership.